Wooden Coasters: braking systems Part 1. The first wooden coasters had an employee riding a seat in the middle of the train. Those “scenic railways” were side friction rides and the brakeman would slow the train down in order to safely go down the hills and cross the dips. The brakeman would pull a lever and this would drop down sabots which would rub against the running wheels and slow the train down. Later on, the brakeman was replaced by brakes mounted on track sections. The first brakes are traditionally referred to as “skid brakes”. The version most often seen involve mounting two parallel pieces of wood on a frame. 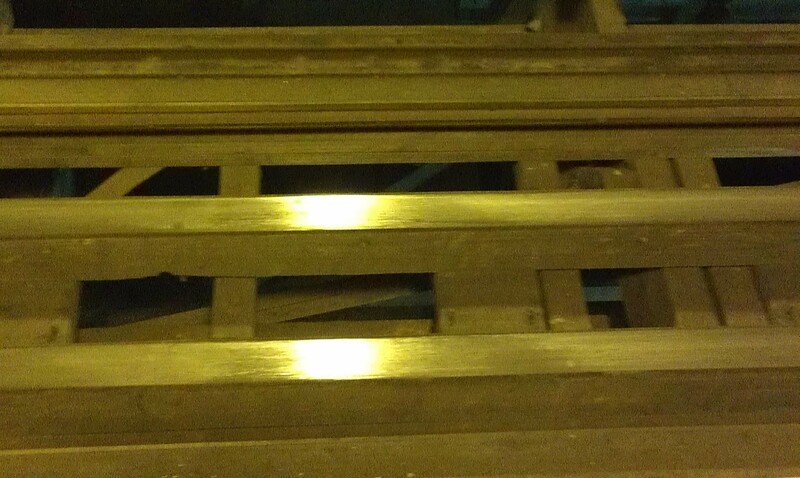 The pieces of wood have a metal covering that is not smooth and rather coarse to help with friction. The train is slowed down by having the whole frame come up and rub against two friction plates under the car. The main advantage of that system is that the brakes frames can be build which ever way the designer needs it to be. In the case of many older rides, the final curve of the ride which leads into the station was the brake run. The two pieces of wood in the center of the track are the brakes. They lift and rub against friction pads. The older brakes were activated by a few different systems depending on the manufacturer and ride configuration. A popular “speed adjuster” system was to have the frame mounted on a large lever. That lever had ratchet positions and the maintenance worker would manually adjust the position of the brakes with a pin. As well, to counter the action of the train that would try to lower the brake, the maintenance would add a large quantity of weight and adjust it depending on the season. The Phoenix at Knoebels (Elysburg, PA) has a large cement counterweight for the speed reduction brake. The height of the brake would vary based on weather and expectations of the train loads. Also, if the ride was to run two trains that day, the speed reducing brake before the safety brakes would need to trim more speed to provide a more comfortable stop in the pre station brakes. The station and pre station brakes would often be operated by a cable and pulley system connected to a large lever in the station. When the brakes would be in the UP position, the lever would be tied to a rope to prevent it from moving when not in use. When operated, the rope would be removed and the operator could then lower the brakes as he saw fit to park the train in the unload or load position. The Giant Dipper at the Santa Cruz Boardwalk in California use a different style of skid brakes. It opened in 1924 and the brakes are those two raised metal strips. Later on, the station brake mechanical system was replaced by a pneumatic system. There would be small throttle joysticks that would allow the ride operator to control his brakes. Eventually, after the Matterhorn Bobsleds in 1959, many rides were converted to have automated braking. This reduced greatly the possibilities of overshoot in the station and made the ride a lot safer. Pneumatic actuator used on the Monstre at La Ronde (Montreal, QC). Note the backup springs. In this case, the brakes are in the “lower position” and thus allow the train to roll down. In the case of an air pressure leak, the springs would pull the brakes back into the “upper position” and stop the train. Skid brakes are not very efficient when they are wet, so the braking areas need to be covered to prevent issues. Also, starting in the 1990’s, most parks in North America systematically go down to a one train operation when it start raining. National Amusement Device came up with the first roller coaster fin brakes. Those rides which eventually became the industry standard consist of a steel fin bolted vertically under the train. On the track are two parallel “jaws” mounted in a caliper position which grip the fin and thus slow or stop the train. On the first installations, the brake calipers were mechanically operated like skid brakes. Then, NAD made them pneumatic using throttles. A great example of those brakes is at Camden Park in Huntingdon, WV. The Big Dipper (1958) use the mechanical fin brakes and the junior sized Lil’ Dipper (1961) use the pneumatic brakes. Up until around 1981-1982, with a few exceptions, the standard remained skid brakes on roller coasters. Around that time, Philadelphia Toboggan Co. (now the Philadelphia Toboggan Coasters Inc./PTC) adapted the fin brakes to their trains and started manufacturing brakes and retrofitting braking fins to their existing cars. The first ride to be confirmed to have opened with PTC fin brakes was the Grizzly at Kings Dominion (Doswell, VA) in 1982. The fin brakes allowed braking areas to be shorter and to not be covered like those with skid brakes. Many parks will run only one train on their when there is a threat of rain and the fin brakes do not have that disadvantage. They are more reliable from an operational point of view. The PTC brakes use a long vertical fin mounted under the car. The fin on a PTC train is around 1 inch wide and is grabbed by calipers mounted in the middle of the track. Those long calipers are sometimes as long as the car and activate by an air servo. The brakes are closed by springs once air is no longer applied to give a fail-safe braking system. In the station and slower speed sections, PTC also manufactures shorter lengths of calipers. This is used for example by Gravity Group in the station of the Wooden Warrior roller coaster (Quassy, Middlebury, CT). The PTC fin brakes are very efficient in stopping a train quickly and on a short distance. Custom Coasters International (CCI) frequently took advantage of that and featured very short braking areas at the end where only 4 or 5 calipers were placed. Tonnerre de Zeus at Parc Asterix (Plailly, France) opened in 1997 with only four brake jaws and featured a sudden and abrupt braking motion. 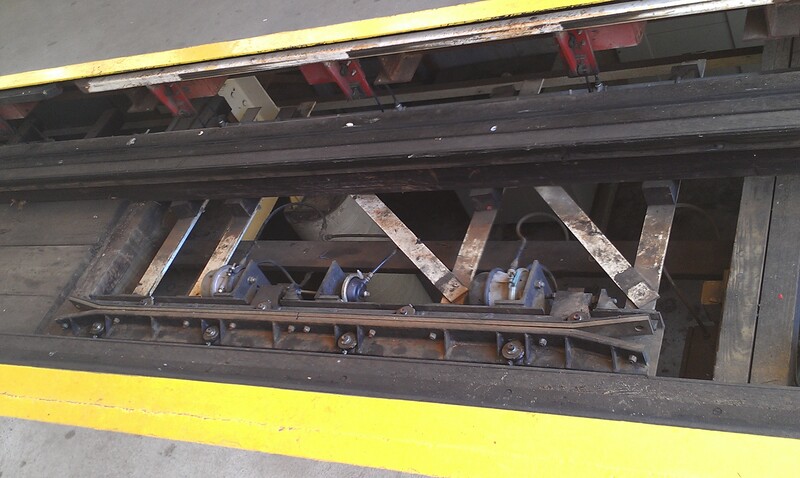 After that, many parks modified their rides to remove the skid brakes and install the new PTC fin brakes. But, there were some struggles with that. For example, the Great American Scream Machine at Six Flags Over Georgia (Austell, GA) used to have curved skid brakes. When the ride got equipped with new brakes, the fin brakes can only go on straight track sections. So, all the brakes had to be concentrated in a small straight area and it gave a more sudden and violent braking motion than before. With time, the park managed to adjust the brakes, but at first, it was a struggle. Another issue is that for some rides, such as the PTC built Yankee Cannonball at Canobie Lake Park (Salem, NH), the track does not allow enough clearance to allow a fin to safely be installed. CCI retrofitted their own fin brakes on some older roller coasters, like the Montana Rusa at La Feria de Chapultapec (Ciudad de Mexico, MX) and the now closed Screechin’ Eagle at Americana/LeSourdville Lake (Middletown, OH). This entry was posted in Coasters and tagged Coasters, PTC, Systems, wooden coaster. Bookmark the permalink.